I have never really camped before, now ready to book the Darwin to Perth, it was all just brilliant , can't believe I did it. I thought I loved India [ done 8 tours there] but now need to ditch the o/s brochures and work my way around the Australia one. Loved sleeping in the swags, sitting around the fire and learning so much about my own country that I wasn't aware of. Also interesting to hear about the journeys of the younger travellers and their perspective of Australia. Welcome to South Australia, where your adventure begins. You’ll be picked up from the Adelaide Central YHA at 6.30 am, so please arrive at least ten minutes before. Leave South Australia’s capital behind and head for the hillside vineyards of the Clare Valley, passing through a string of classic country towns on the way. After lunch enjoy expansive views of the Flinders Ranges as you drive towards Wilpena Pound, a natural amphitheatre of rocky mountains. Enjoy an easy group hike to explore the area. Spend the night camping in the Flinders Ranges, within the comfort of a swag (Australian bedroll). Total driving time takes around five hours. This morning, head out on a long day of driving (approximately 8-9 hours). 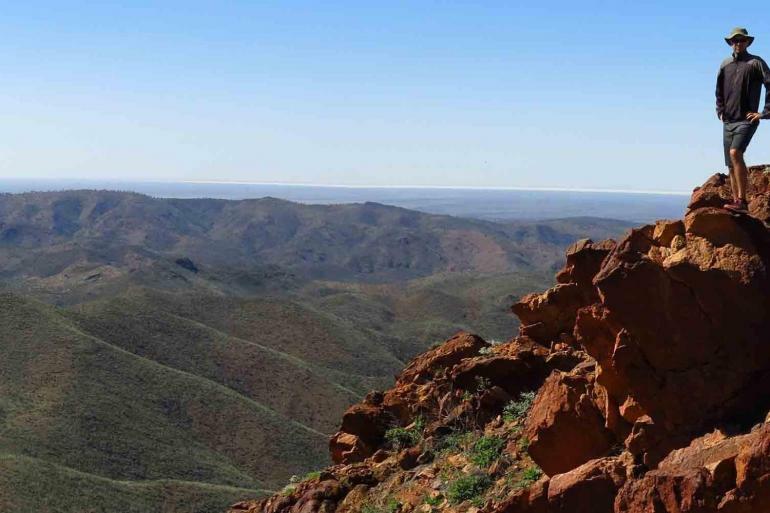 Leave Coober Pedy and journey across the Moon Plains. Pass the Dingo Fence (the longest fence in the world) and take in views of the Breakaways Reserve, which was made famous by the film of Mad Max III. 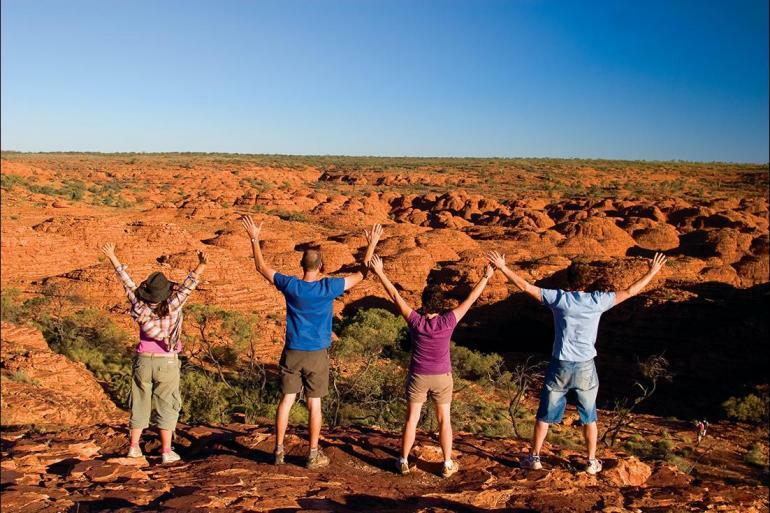 Late in the afternoon, arrive into Yulara in time for the sunset and enjoy some relaxation time at your campsite. Tonight sleep in a permanent tent or curl up in a swag. Today driving time will be about 8.5 hours. Rise early this morning and be rewarded with a glorious Uluru sunrise. While the day is still fresh, enjoy a walk around the base of this incredible sandstone formation, which is of great spiritual significance to the Anangu people. We walk to the cave paintings near Mutitjulu Waterhole at the base of Uluru where you wiill be in the hands of an Anangu guide who will share the stories of this unique landscape and explain the Art, the Culture and connection to Land. This exclusive experience will give you an exclusive insight to the meaning behind Anangu art and traditional culture. The on-site Cultural Centre also houses an extensive collection of Aboriginal and Torres Strait Islander arts and crafts for you to browse. Head back to camp for lunch. There isn't much driving today, about an hour in total between destinations. You will walk approximately 5km. Today, explore one of the Red Centre's greatest treasures: Kata Tjuta. The Olgas, as they're also known, are a group of domed red rocks rising spectacularly out of the desert. Like Uluru, they’re sacred to the Anangu people and are believed to be 500 million years old. Return to camp for lunch before travelling to Watarrka National Park (Kings Canyon). Spend the night in an exclusive campsite inside the park. Driving time is about six hours today, and you will walk approximately 2km. Put your hiking shoes on this morning and head out to explore the impressive formations and rock faces of Kings Canyon. Trek for 6 km along the Rim Walk, which takes you through a natural amphitheatre, past the striped sandstone domes of the ‘lost city’ and into the green oasis of the Garden of Eden. Enjoy a last lunch before making your way to the outback hub of Alice Springs (approximately five hours), where your adventure comes to an end. There are no more activities planned for today and you’re free to depart. Driving time today is approximately 5 hours back to Alice Springs, and the Rim Walk is approximately 6km. Guides All group trips are accompanied by a group leader. In Australia your group leader is also your driver, taking you from start to finish in a specialised vehicle. The aim of the group leader is to take the hassle out of your travels and to help you have the best trip possible. Yor leader will provide information on the places you are travelling through, offer suggestions for things to do and see, organise the camp and cooking for camp or kitchen cooked meals (though passengers are required to help out) as well as recommend great local eating venues. They will also introduce you to our local friends along the way. While not being guides in the traditional sense you can expect them to have a broad general knowledge of the areas visited on the trip, including historical, environmental, cultural and social aspects.